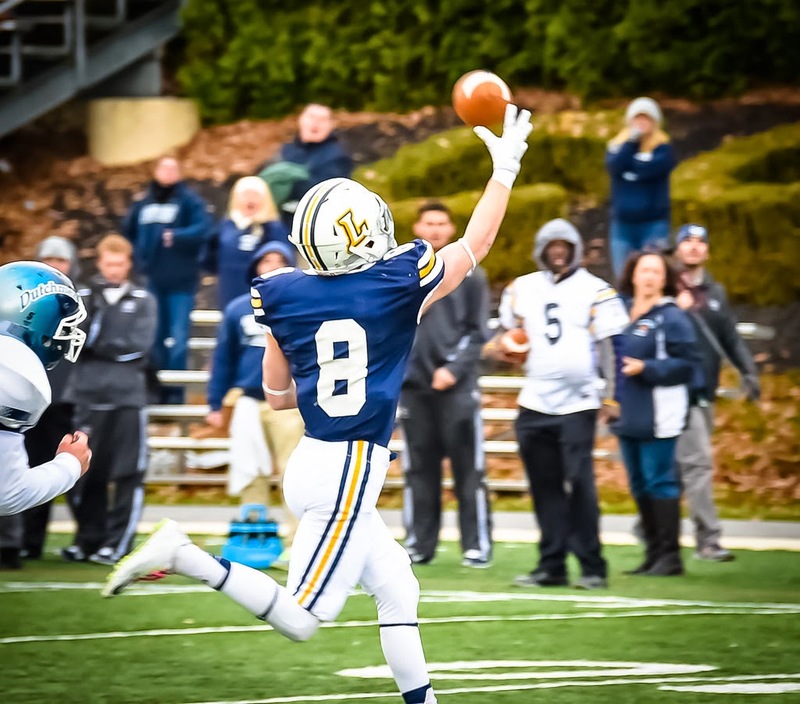 WILLIAMSPORT, Pa. – Junior Ryan Umpleby (Forest Hill, Md./Fallston) caught 10 passes for a school-record 228 yards and three touchdowns, his last coming on the Lycoming College football team’s first play of overtime to lift it to a 30-29 Middle Atlantic Conference win at David Person Field on Saturday, Nov. 8. After Lebanon Valley (3-6 overall, 3-5 MAC) scored on its possession of overtime, using just three rushes, freshman Shaviah Coleman (Delran, N.J./Delran) got a piece of the extra point, giving the Warriors (7-2 overall, 6-2 MAC) a chance to win the game with their possession. 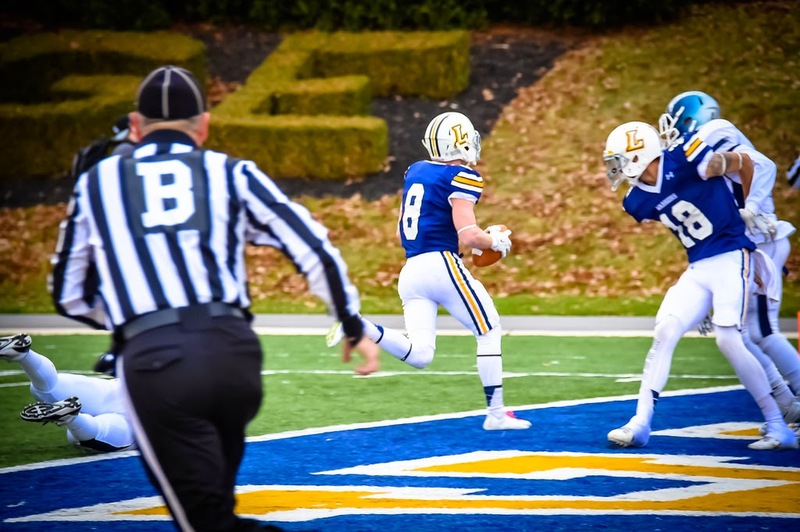 On a fly pattern, Umpleby ran into the right corner and made an over-the-shoulder grab near the near pylon, setting up the all-important extra point, which freshman Devon Flynn (Levittown, Pa./Conwell-Egan Catholic) drilled, setting off the celebration. The 10th catch of the day for Umpleby helped him surpass the school-record of 215 yards set by Warren Oliver against Westminster on Sept. 10, 2011. The junior wide receiver is the first player in school history to post two 200-yard receiving games in a career, as he also notched 203 against Widener on Oct. 25. Senior Tyler Jenny (Glasgow, Pa./Glendale), despite hobbling with a leg injury for much of the second half, still finished 24-of-40 with 411 yards, the third-most in school history. He notched four touchdowns and was intercepted twice. Lebanon Valley tied the game at 10 with 1:02 left in the third quarter on a 22-yard field goal by Matthew Smoluk, setting up a back-and-forth fourth quarter. With Jenny sidelined for the first two plays of the ensuing Warrior drive before the fourth quarter began, it looked like momentum was in the hands of the Dutchmen, as they forced the Warriors into a three-and-out. However, the Warriors responded with a 3-and-out after giving Lebanon Valley a short field to work with, getting the ball at the 20-yard line after a punt went into the endzone. The Warriors drove into LVC territory, getting to the 42-yard line, but Trevor St. Clair broke through the line and picked off a short pass from Jenny and ran it into the end zone. A penalty on the return gave LVC the ball at the 28-yard line. It took the Dutchmen six plays, all runs, to plow into the end zone, with Billy Powanda scoring from four yards out to give them a 16-10 lead. A missed extra point followed before the Warriors answered right back, as Jenny found Umpleby on the left sideline near the 40-yard line. Umpleby dodged a defender and hit paydirt, running in untouched for the score. However, St. Clair blocked the extra point, keeping it a tie game with 7:30 left. After both teams traded interceptions, the Dutchmen started an 11-play, 74-yard drive, with Powanda plowing into the end zone with 2:15 left in the quarter from a yard out. The Warriors answered quickly, using three sideline passes before Jenny found junior Corey Talerico (Moosic, Pa./Riverside) on the right side and he ran through the middle getting to the left sideline at the LVC 20. On the next play, Jenny hit Umpleby with a one-handed grab to tie the game at 20 with 1:18 left. The Dutchmen got the ball to the Lycoming 49 on the ensuing drive, but senior Ryan Mihoci (Murrysville, Pa./Franklin Regional) intercepted a pass on the left sideline to set up the overtime. 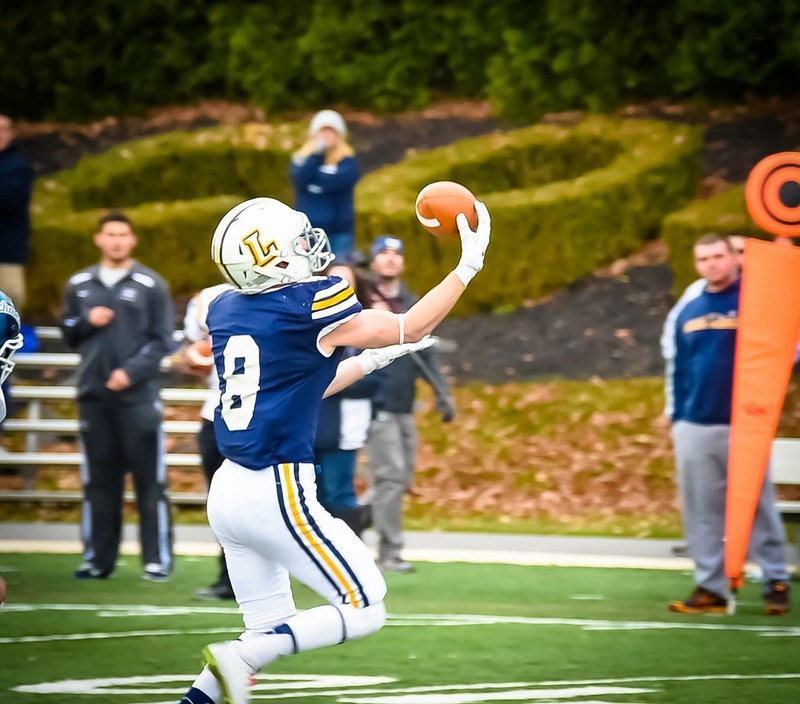 Lycoming got on the scoreboard first with their first drive of the game, going 66 yards on nine plays before Flynn drilled a 23-yard field goal. Both defenses held their ground throughout the rest of the quarter, but Lebanon Valley used a 38-yard rush by Brendon Irving in the second quarter to set up their first score, Powanda charged in from three yards out with 11:16 left in the first half. The Warriors responded as the half came to a close, as Jenny led the team on a 12-play, 79-yard drive, finding Talerico for a 15-yard leaping score on the left sideline with five seconds left in the half on a 3-and-11 play. Talerico finished with seven catches for 88 yards and senior Craig Needhammer (Lansdale, Pa./North Penn) finished with 124 all-purpose yards (34 rushing, 12 receiving, 78 kick returns) for the Warriors, as Lebanon Valley held the Warriors to 82 yards on 32 carries. Brendon Irving finished with 26 carries for 184 yards and Billy Powanda rushed five times for nine yards and four scores. Brian Murphy completed 16-of-29 for 212 yards. He was intercepted three times. Tyler George led the Dutchmen receivers with seven catches for 135 yards. Junior Brian Campbell (Drums, Pa./Hazleton Area) finished with 12 tackles, 2.5 for loss, to lead the Warriors and seniorJermaine Reyes (West New York, N.J./Memorial) made 11 stops. Senior Zack McMenamin (Prospect Park, Pa./Interboro) made 10 stops to go with a sack and Mihoci finished with four stops and two interceptions. FreshmanMichael Ward (Edgewater, Md./South River) notched a career-high stops and his first interception. Frank Gaffney led the Dutchmen with 10 tackles, one for loss and Andrew Livingston posted six tackles and a sack. St. Clair posted an interception, a fumble recovery and a blocked kick and Zach Wierman and Ricky Feggins each had pickoffs. The Warriors will wrap up the 2014 regular season on Friday, Nov. 14, when they head to FDU-Florham for a 7 p.m. Middle Atlantic Conference game.